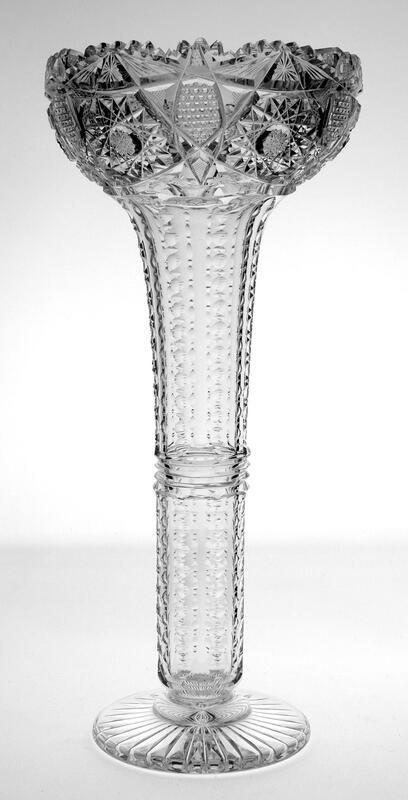 This vase stands 15 1/2-inches tall, has a 7-inch, bowl-like top and weighs 4-lbs. 4-oz. The 1/2-inch thick blank is clear and colorless. The eight notched flutes have clear areas that are wide enough to produce a prismatic effect the length of the hollow stem. We know that page DRE-70 of LABAC’s ‘Cut Glass Advertisements Book 1’ shows a Dorflinger 1896 trade ad with a large vase of this same shape. We know that Dorflinger sold the blanks to other cutting houses — and we know that the design cut on this vase is not shown in any currently known Dorflinger book or catalog. It is difficult to capture the true quality of this vase in photos. A different-shaped vase for your collection that distinguishes itself from those that are ‘ordinary.’ The piece is in better than extremely fine condition and has no internal cloudiness or discoloration. Enjoy!